PINE BELT (WDAM) - Hundreds of campers traded in sports and crafts this past week to give back to communities in Hattiesburg and Petal. This year, 300 campers took part in "Basecamp," a summer camp aimed at helping those in need across the Hub City and Petal. The campers are split up into different groups, from construction and yard crews to support and counselors for day camps scattered across the communities. 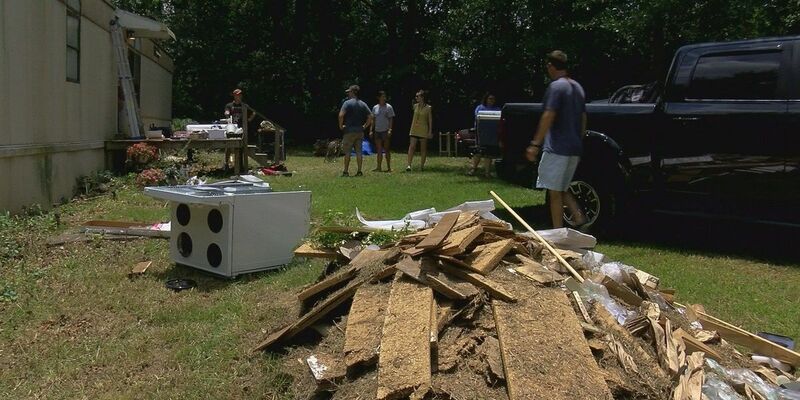 Sunday, a group of campers were at a trailer in Forrest County where they had been working to replace a woman's floor throughout the week. "The grandson had fallen through it like five times, you had to walk on floor joists," said camper Jackson Ford. "Now we've tore it all up and redone the whole thing and it's nice in there." Asbury United Methodist Church started "Basecamp" twelve years ago and now, 13 churches from across Mississippi and Louisiana send participants to the Pine Belt. The campers are housed at the University of Southern Mississippi. "It's really nowhere in particular, we just go where the lord leads us and where people need to be encouraged and lifted up, embraced and told we care," said Brian Hinnant with Asbury UMC. Also Sunday, campers were at DeWitt Sullivan Walking Park in Palmer's Crossing hosting a day camp for children in the neighborhood. Hinnant said the campers go door-to-door in the community, telling parents about the activities and food available for the children. "Its kind of a breathtaking experience working with the youth and see these students give up their time when they didn't have to," said Ben Bullock, who spent the week with the group of campers fixing the trailer in Forrest County. "Giving up a week of their lives to come out and share their experiences and time with other people and give their talents to help someone else out." This year's theme for "Basecamp" was hope, for both the residents in the communities and campers. "It really impacted me on a spiritual level," Ford said. "You get to really see what kind of effect it really has on the homeowner and it makes you feel good." Copyright 2017 WDAM. All rights reserved.